Time for that new sandbox? Here are some terrific, and free, plans for a sand box that is simple to build and has a feature that will keep the pests out. After all, you don’t want your child’s sand box to turn into the neighborhood litter box. It is the time of year to break out the power tools and get to work on those fantastic outdoor woodworking projects. If you are like me, you love working with wood outdoors and building a play structure in the yard can be a great way to enjoy the beautiful weather and work with your family or friends. 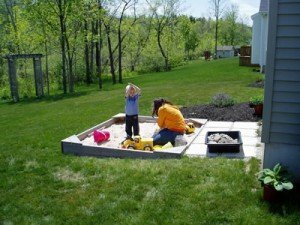 The free sandbox plans below is something that I used when I built my son’s sandbox 7 years ago. The beauty of a sandbox is that you can build it any size you want without altering too much. This plan has a simple corner seat design and also calls for a top to keep animals out. We purchased the material to make the top, but never completed that portion of the plan since it didn’t become an issue in our neighborhood. When selecting the lumber to use, keep it safe for the kids! If you are using a pressure treated lumber, you might want to rethink it. There can be some harsh chemicals used to treat the lumber and not all pressure treated is safe for children. Keep in mind, this sandbox won’t be used forever, so a material that will hold up for 10 years with direct soil contact might not even be necessary. I used Western Red Cedar for ours and it was as solid as the day I built it 5 years later when it was removed. You also need to be sure that you purchase “play sand” for the box. Don’t simply use sand that is used in construction since it is not suitable for use by children due to some of the material added. Visit the link below to find the complete sandbox plans. There is a nice diagram along with step – by – step instructions. Good luck and have fun… I know that we did.